At a time when various banks are still struggling to create their own UPI based apps for making and accepting payments, India’s biggest ecommerce portal has already launched one. Hailed as India’s first UPI (Unified Payment Interface) mobile payment app, PhonePe has been launched in association with Yes Bank. We tested the app, and used it for peer to peer funds transfer as well. The UI and UX, both are stellar, seamless and fast, however, the funds transfer we initiated couldn’t be completed, despite the fact that amount was deducted from the bank account. But first, let’s understand why Flipkart, which is an ecommerce portal, had to launch a mobile payment apps, that too powered with UPI? 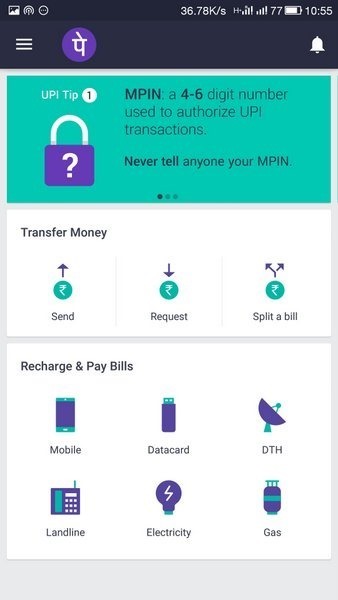 PhonePe being being seen as a direct competitor to the likes Paytm and Freecharge, which, along with MobiKwik are India’s top 3 mobile wallets. Flipkart, powered with PhonePe, is now challenging the dominance of these existing mobile apps, with their own mobile payment app which works much more than a wallet. PhonePe has an interesting history. Sameer Nigam and Rahul Chari, used to work with Flipkart, quit the company and launched PhonePe as a mobile payment app. In March this year, Flipkart acquired the company, despite having their own Flipkart Money app for mobile payments. Now, in September last year, Flipkart acquired a company called FX Mart, which allowed Flipkart acquire a semi-closed wallet license as well (which RBI had provided to FX Mart). Now, PhonePe, which is a combination of semi-closed wallet and payment app, would be managed by FX Mart. 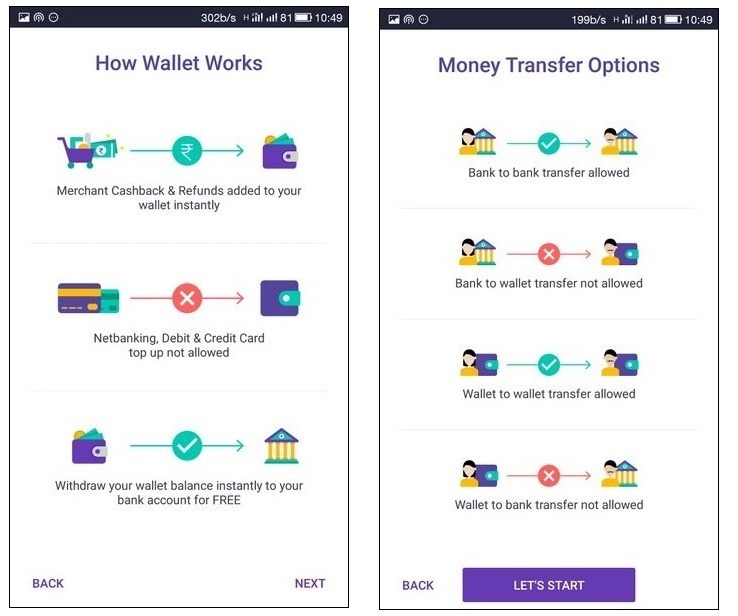 From now on, balance remaining in Flipkart Money and Myntra’s ‘My Cashback’ would be transferred into PhonePe app by default. Flipkart is going to spend Rs 670 crore for marketing PhonePe, as they are expecting 12 million users by December end. In association with Yes Bank, Flipkart has smartly converted PhonePe into a UPI based mobile payment system, along with functioning as a semi-closed loop wallet. Users can make peer-to-peer transfers, pay their utility bills and even split their bills among friends directly from the address book. 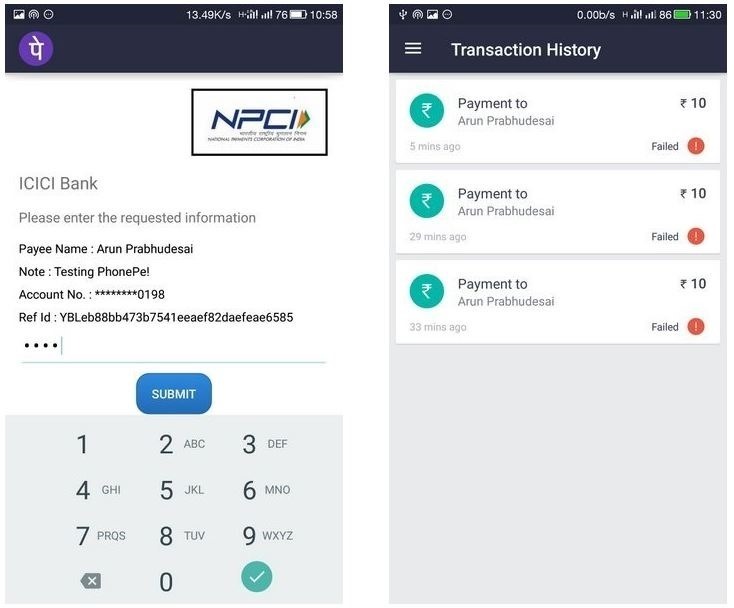 As we installed PhonePe, we realized that besides Yes Bank, we can add accounts from 19 other banks, which includes all the banks which have started offering apps for UPI based payments. Connectivity with HDFC Bank, SBI, Kotak Mahindra Bank and Bank of Baroda would be notified later. Initiating this app is very simple, to say the least. All you need to do is verify your phone number, which is done by automatically sending an SMS from your phone; Activating the wallet; Linking your bank account and done. A unique MPIN is assigned, which works as a key for all transactions for this app. A separate MPIN is required to activate the wallet, which is provided by the bank. If we speak of the wallet, then being a semi-closed loop wallet, top-up is not allowed via bank accounts; however, any cashback or discount or payments received would be stored in the wallet. The payment can be done either via wallet balance or from the attached bank accounts. 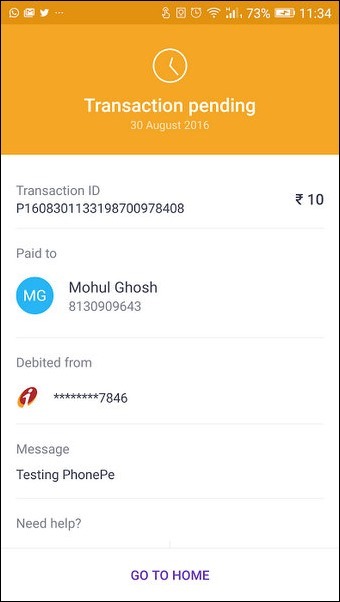 As I tried to make a small payment to my friend Arun, I encountered a bug: the amount was debited from my bank account, but the transaction showed as failed and Arun didn’t receive the amount. The same way, when Arun made a small payment to me, the amount hasn’t yet credited to my wallet at the time of writing. The fact that money cannot be loaded into the wallet can be the only major obstacle for this app. However, for those, who operate several bank accounts, this single app can turn out to be the sole mobile interface for making every type of payments. We will keep you updated about the funds transfer bug which we encountered on PhonePe. 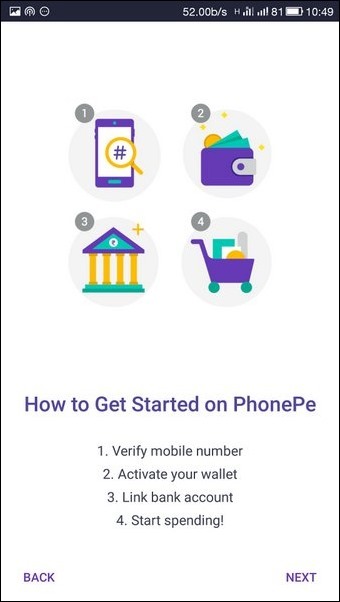 Do let us know your experience of using PhonePe! "Flipkart Launches PhonePe UPI Based Payments App [Review]", 3 out of 5 based on 4 ratings. The minimum balance that you can transfer by using UPI is rs. 50. I think that is the reason your test transaction failed. LOL! It doesn’t work the *day* they launch it!! :) Will it start working *someday*? ?